Discussion in 'Online Games - News and Reviews' started by Marina, Sep 7, 2014. Holland Power Gaming designed this game centered on Dutch players. Seems very homey and welcoming. 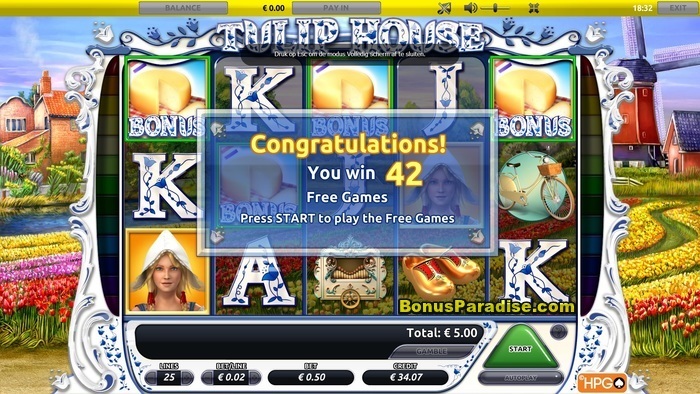 Players can play Tulip House online for real money at Goldruncasino. HPG (Holland Power Gaming) continues to impress the world of video slots with some unique games. They offer some of the risqué for all you adventures and some tame slots for those that like the less exuberant. With Tulip House, all traditional styling for Dutch is abundant. When you think of Holland or the Dutch, what's the first thing you think of? Is it tulips? Is it wooden clogs? Is it windmills? Or if you're a history buff, then you'll know about the Deltfware pottery, which this video slot is designed around. things in my home with the blue and white design. Hmmm, I wonder if some of them are of the original Deft pottery? History lesson over and onto a great video slot. background of colorful tulips and spinning windmills all players will feel as if they've been transposed to Holland. Not sure if it's the soothing musical sounds or the eye catching graphics. The background sound is the song "Tulips from Amsterdam". A very romantic melody that relaxes the soul. If you're not into that, then just click the button to turn the sound off. Either way, it's a nice way to spend an evening spinning on Tulip House. Now if only they could find a way for some realistic smells. Take a spin and smell a tulip. That sure would be nice. But, I don't want to take a spin and smell a cow, lol. If anyone can do it, it would be HGP. Virtual smells at a spin. video slot that is spread about 5 reels and 3 rows. At first glance, the casino interface may seem a bit intimidating. Take a moment and equate yourself on how to use it. interface, players can choose the number of lines to play, which is 1-25 as well as the amount of coinage they wish to bet per spin. Choose from .01 to 1.00 per line, per spin. You will also have the choice of playing in autoplay. I find that a nice feature if I'm on a roll and need to take a quick break. I hate to stop spinning in the middle of a winning streak. is for you. You will choose between red or black and which suit. You can win double or quadruple the winning amount. To see what your spinning for, click on the ?. It will show all winning symbols as well as the paytable and rules for the slot game. I suggest you always check this out before spinning. With Tulip House, all wins pay left to right except the Scatter Cheese Wheel. Your slice of cheese could appear anywhere on the reels and will start an incredible free spin feature. Receiving 3 or more and you'll be immediately flown into the Dutch culture to grab some incredible winnings and boost that bankroll. The Netherlands never looked so good. Tulip House Logo, Windmill, Cow, Bicycle, Tulips, Calliope, Clogs, Ace, King, Queen and Jack. In some cases, only 2 matching symbols in a winning payline will bring you a win and then again you may need three. you have now activated the free spin feature. Holland here I come! The free spin feature is quite interesting. Watch as the ? reveals the number of free spins. When you land 3 Scatter Cheese Wheels you could win anywhere between 5 to 30 free spins. If you land 4 Scatters, you'll have a chance of being rewarded with 10 to 60 free spins. The ultimate at free spins is if you should you land 5 Scatter Cheese Wheels you'll get a chance of winning up to 100 free spins! During the free spin feature, players could receive a multiplier for their winnings of 1x to 10x the amount. Now that could earn you some serious cash. The feature could be retriggered should you receive 3 or more Cheese Wheel Scatter symbols. It's the ultimate Dutch adventure. "Tip Toe Through the Tulips", well here's your chance playing TulipHouse with Goldrun Casino. It will immerse you into something like no other. 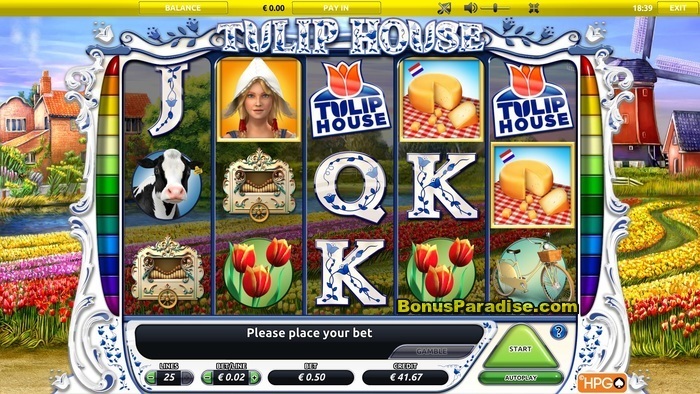 Have you played Tulip House Video Slot? I am curious how players like this game. Even if I don't like delft pottery, I really going give the Tulip House Slot a try! This slot looks really fun and I love the fact that you can win so much free spins! Thank you so much for this incredible review! Wow, that looks like a great slot game. I always love the free spin feature. Too bad I'm in the USA and can't play it. Maybe someday more and more sites will open up for me. Good luck to everyone that plays it. Sure looks fun. This is really a nice Video Slot! if the music you'll hear already in a party mood it really is a beautiful game. Ellis, Kotsy, Mike and 1 other person like this.